How do I add a heater to my bench ???????? flashman wrote: How do I add a heater to my bench ???????? Wear a onezee while shooting & eat a can of baked beans 12 hrs before you shoot...? I used this thread and this video on YouTube as a guide for making one also. I ended up getting a Kincrome saw horse, because they were very sturdy and have locking pins, and I used this Formrite sheet for the top. The piece of wood that came with the saw horse I used to brace the legs to the top and bolted it all together. It came out pretty good, folds flat and is very sturdy, it easily held my weight 6'2" and 100kg. Total size is 1000Lx600Wx780H and it weighs about 7kg at a guess. I still need to do round some corners, do some sanding and cut a handle into each side, not sure if I should paint the top board or cover it with marine carpet. Anyways here's pics, thanks to everyone in this thread for the inspiration. that's a tidy looking bench you've made mate, and thanks for the pix. 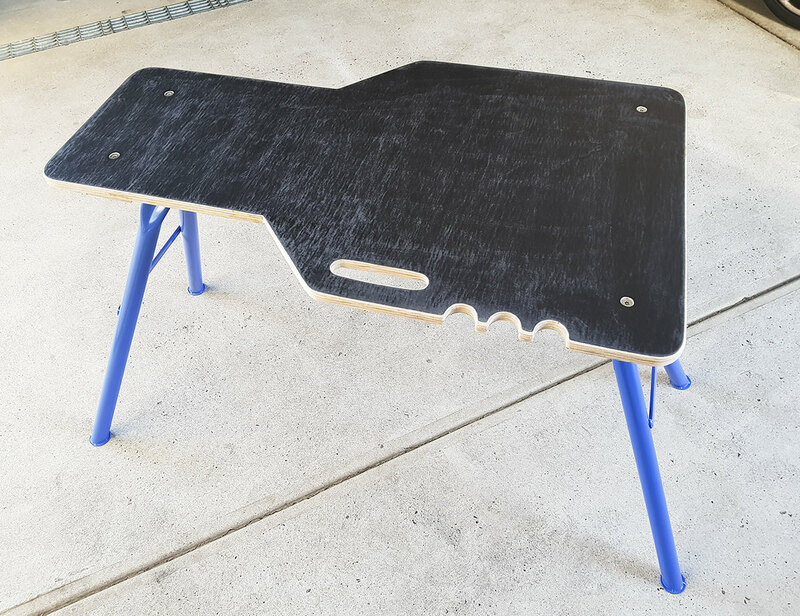 i might have a crack at making one like it myself this weekend. I've cleaned it up a little, rounded the edges, cut out a handle and some notches in case I want to lean a rifle or two against it. Still needs a paint. But is it high enough to sit on a stool or chair and shoot? The reason I built mine the way I did was for that reason. On average about 100mm higher from memory. Of course you don't mind if anyone copies it do you? Mate i rekon a few of us have copied a few of us on here...so copy away...!! Actually thinking about it old bloke...what about those cut-outs for the rifles to rest in--if its short in height might hit scope ey...? If so maybe do bigger cut outs...? I just cut a couple of V shaped notches in mine. green_comet wrote: But is it high enough to sit on a stool or chair and shoot? Doesn't seem to be short to me, was spot on using my eski as the seat. My cousin took it out over the weekend and said it was perfectly fine. I don't want to get too critical with it though, it's just something to throw in the car and bring with when we go shooting. bigfellascott wrote: The fold up ladders and a bench top on em make great shooting benches - ones with ajustable legs are even better. Well thank you. 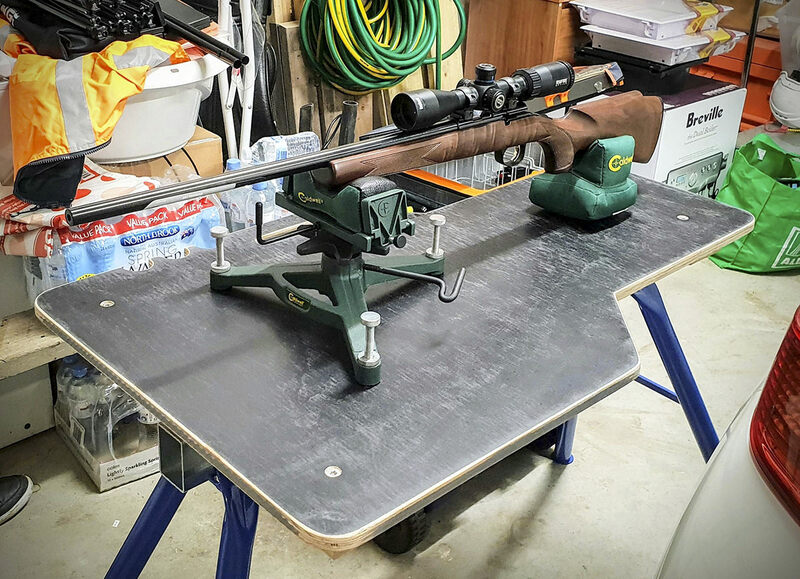 I've been contemplating some way to accurately sight my rifle in - my club doesn't have benches. Mmmm.... Perhaps the one you bought is a bit higher than the couple I looked at. In any case both options are pretty good. So yesterday decided I need a shooting bench, as my 1000L IBC is not stable enough. So got me a 10 dollar formply sheet. And 2 saw horses. Had an hour as the wife and kids are hunting for food.... at a butcher. So started working and spied the work bench with folding legs I had lying around from the Bosch circular saw I never really used, as the saw got relegated to cutting aluminum channels. So a few minutes later I have my new shooting bench ready and painted in matt black cuz we is coolz.